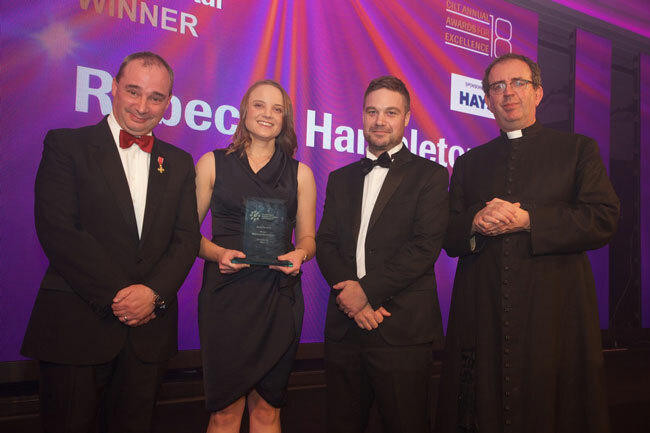 Rebecca Hambleton, Operations Manager at BT Supply Chain, has won the Rising Star Award at the CILT (Chartered Institute of Logistics & Transport) Awards after overseeing an ingenious project to redevelop the picking facility at the company’s national distribution centre in Magna Park. BT Supply Chain won the contract to support the national roll-out of smart meters to a key customer’s residential and small business customers. With volumes growing exponentially, BT faced a challenge in sustaining rapid output within a limited operational footprint. Rebecca was tasked with doubling picking capacity within the existing space. To complicate things further, the physical redesign had to be fully completed across just one weekend, to ensure there was no impact on service levels to the customer. 25-year-old Rebecca, who joined the business in 2016 on BT’s business management graduate scheme, oversaw the project from beginning to end. After running brainstorming sessions with the picking team, Rebecca helped to develop the ingenious solution. The answer was to build two U-shaped pick areas, carefully controlled to allow a circular flow that increased efficiency and reduced travel time with the warehouse. During installation, Rebecca co-ordinated all internal teams and external contractors to make sure everything was in place prior to the Monday morning shift. “Rebecca fully led this project from start to finish. Her motivational skills kept everyone engaged throughout, and the new system was delivered without a hitch – delivering double the volumes we were seeing before” explains Mike Gauterin, MD of BT Supply Chain.